Catch up with #6 here. Well if you have read the previous entry (link above) you will know that we had part of our day sorted! 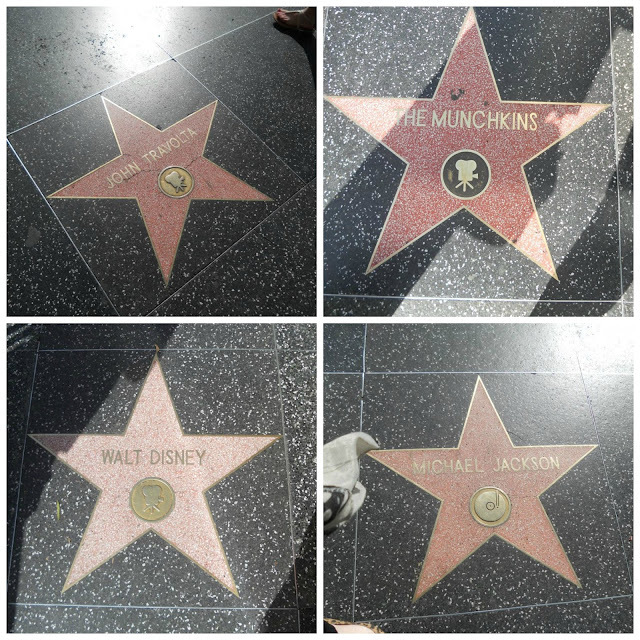 Aswell as wanting to obviously go on the celebrity houses & Beverly Hills tour we also knew that we were going to go and watch TWO stars get their stars on the walk of fame! These two Hollywood babes were Felicity Huffman (Lynette from Desperate Housewives) and her husband William H Macy. This was happening at around 11am I believe it was so we left our apartment a bit before to have a look up and around Hollywood Blvd! We also got our tickets for the tour later that day! We decided to go with Starline tours - we had heard alot about them, they seemed really legit and it seemed just up our street! We booked on to the 12pm or 1pm trip and with our tickets in hand headed over to where the paparazzi were setting up hoping to get a good view of this once in a lifetime opportunity! We were so excited that after only waiting there a few minutes Felicity appeared and came towards the crowd that was mounting! She seemed so lovely and was making time for everyone - she obviously looked stunning - amazing body, amazing hair and amazing teeth was all I could think. A little while later and with all the paparazzi there ready and waiting for the ceremony to begin we noticed that hovering to the right of us was gorgeous red head that is - Marcia Cross aka BREE! 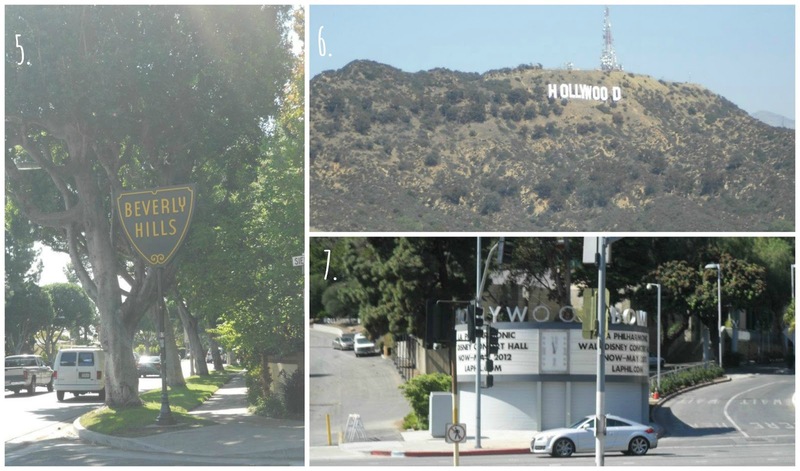 I know this is Hollywood and we probably should have expected it but ... it was exciting! Two girls from the little Isle Of Wight in the middle of an amazing LA event! The speeches they gave were brilliant and hilarious and after the stars were revealed and the press had gone bonkers it was time for us to head to our awaiting tour bus! Our tour guide was called Andrew and we loved him! He was so so informative and you could tell that he loved his job! The tour was a good few hours and it was in an open top mini bus which was so fun (although it was actually quite windy which meant we were bloomin' cold but it didn't bother us!) We all wore headphones so we could hear Andrew and had our cameras at the ready! 1. Hollywood Bvld. the road next door to our hotel was where the tour began there were about 10 of us in the mini bus I would say and from all over the world - America, China, Germany and of course us Brits! 3. This is us just as the trip was abaout to begin - Headphones in and ready to take it all in! 4. Me doing an awkward pose with the world famous backdrop - there was a queue to take photos so I definitely ran in - ran out. Not impressed with my hair or pose but thats life haha! 5. 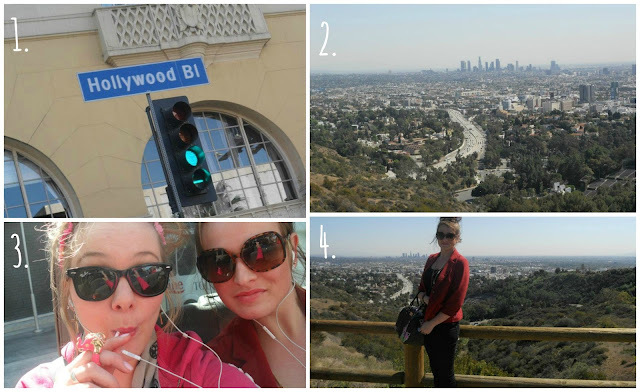 Check out the sign - the Beverly Hills sign! We both definitely let a squeal of joy creep out when we saw this! Everything in BH is so.... rich. Even the fire hydrant's are painted platinum! 7. The Hollywood Bowl we only drove past this quickly but it wasn't actually that far from our hotel so we did drive past it a few more times throughout our stay in Hollywood - so many amazing artists have played here and more recently it was featured in 90210 - remember that? 8. Now I thought I'd just pick a few houses out for this post as I have photos and photos which you probably all just won't care about! 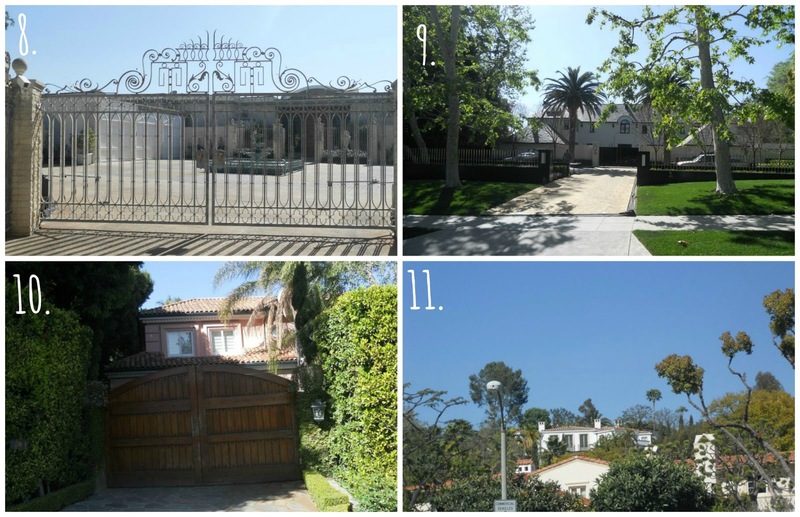 This is Julia Roberts home and it at the end of a Cul de Sac road if I remember rightly and next door to Elvis' first west coast home! 9. This house isn't up high in the Hills like a few of the others but actually down a street in Beverly Hills and believe it or not it is actually Simon Cowell's house! Yup you could just walk on up to that gate if you wanted, Andrew said that previously that week they'd had Simon come out and greet the tour bus - can you actually imagine! 10. Well you may recognise this house if you watch a lot of TV.... it is The Osbournes! Remember that gate from the opening titles of the show? I knew who's it was before they'd even said it, although I'm not sure that they still actually live there! 11. Well the only pf this house you could see was the part of the roof, this family does not want to be spotted and fair enough to as it is The Beckhams! This is the closet the bus coould get so I got photos of the most I could! I have so so many other photos from this day and didn't want this post to be overly photo heavy/the longest blog post in history so that's it for this post. I will be uploading part 2 of Day 8 really soon - more of the tour around LA, Madame Tussuards and my first trip to Hooters!